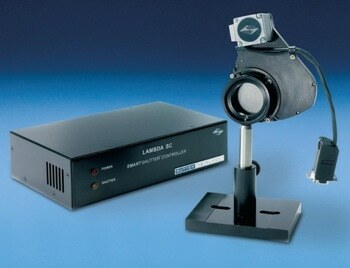 The Lambda SC from Sutter is a full-featured microprocessor controlled shutter driver for the SmartShutter™. It supports the same shutter command set used for the company’s other Lambda controllers and offers improved performance through supplementary modes of operation. The supplementary operating modes facilitate programmable control over the exposure time, and the delay between trigger and shutter opening. In the Lambda 10 series of filter wheel controllers, shutter timing is controlled directly by the TTL input or the time of occurrence of commands. In most cases, the system software used with these controllers is provided with options for controlling the timing of the shutter. The Lambda SC shutter controller can be used in applications that would benefit from improved control options integrated into the controller. It is possible to operate the controller remotely from a computer via the USB port, or opened and closed using a logic level input. In the free running mode, the shutter will open and close repeatedly. The time between closing and reopening can either be set as an interval for the entire cycle, or directly timed. Delay and exposure intervals can be fixed by the user for up to five hours with millisecond resolution. This mode can be programmed to repetitively run or loop for a specific number of cycles. The mode is initiated from power up, or a trigger pulse, and can be stopped by using a stop command. As Sutter’s patented SmartShutter has a built-in microprocessor controlled motor/wiper design, the trajectory of each move can be controlled and the motion of the blade optimized for speed or for smoothness. When speed is the most vital condition, the user can choose the fast mode. If the modest amount of vibration in the fast mode is disagreeable and speed is not vital, the “soft” mode can be chosen, moving the blade slower through the overall travel. The neutral density mode leads to a partial opening of the SmartShutter. It is possible to select any one of the 144 steps, from a fully closed to fully open. Using this variable aperture opening coupled with a liquid light guide acts to spatially homogenize the light to generate a uniform spatial illumination that is autonomous of the geometry of the input illumination.